A team from Leti and the University of Grenoble-Alps, along with Leti’s international partners, have developed a technique to diagnose performance problems of nanoresonators, nanosensors used in industry, research and medical diagnosis. These nano-electrical-mechanical systems (NEMS) have never been able to operate at full capacity. The discrepancy between the theoretical limit of detection and the degraded practical limit has not been explained until now. The researchers were able to understand this phenomenon thanks to their new approach, which is featured in this month’s Nature Nanotechnology, published Feb. 29, and are working on a solution to this problem. Nanoresonators are comprised of a cantilever (middle) vibrating at a certain resonance frequency. The vibration is translated into an electrical signal that transmits information electrically. These systems can detect a mass or force. With mass, they can identify and quantify particles or gases. With force, the systems can be used for medical imaging or scanning surfaces on a subatomic scale to study, for example, the interactions of DNA and proteins. 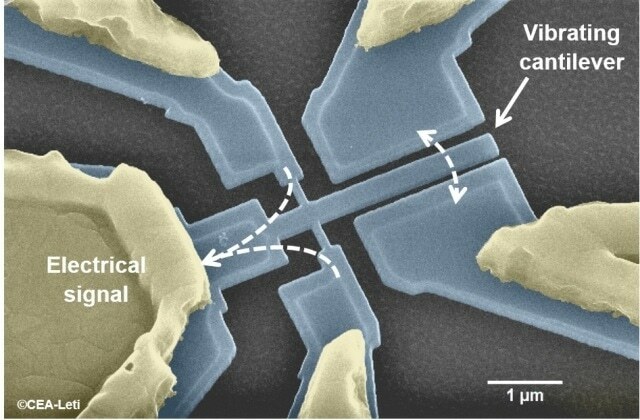 Comprised of a kind of "nano string", nanoresonators vibrate at a certain resonance frequency. This frequency changes when gas molecules, or biological particles, accrete on the surface of the nanoresonators, where they are identified for applications such as medical diagnosis. The tiny dimensions of these devices (less than one millionth of a meter in width) allow highly sensitive detection (Figure 1). This resolution, however, still has a detection limit because "background noise" interferes with the measurements. The observed background noise, which researchers have always considered to be intrinsic to the systems (Figure 2), nevertheless remains well above that predicted by theory. But because it has been impossible to understand this phenomenon, researchers historically have not pursued an explanation. The Leti team and partners reviewed all frequency stability measurements reported in the scientific literature, and showed that a difference of several orders of magnitude existed between the commonly accepted theoretical limit and experimental measurements. In addition to assessing this gap, the researchers developed a technique to evaluate nanoresonators by studying this problem with their own resonators in very pure monocrystalline silicon. 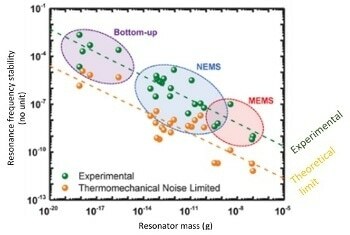 To measure mass or force, researchers measured the resonant frequency – the frequency of the electrical signal emitted by the nanoresonator. This frequency is determined by the material and the geometry of the device. Like any signal, it is degraded by random noise, which affects the useful signal. This widely accepted theoretical limit can be quantified but not eliminated. This limit is still much lower than that observed for all devices worldwide. The resonance frequency of a nanoresonator is theoretically fixed because it is determined by the nature of its source material and its geometry. By causing vibrations at several other defined frequencies near its resonant frequency, Leti researchers have demonstrated that in addition to anticipated theoretical background noise, another effect interferes with the resolution limit that the device detects: its resonant frequency varies slightly. These resonance frequency fluctuations result from the extreme sensitivity of these systems, which detect very small variations in mass and force, but also are very sensitive to any variation in temperature, movement of molecules on their surface and other factors. These parameters can no longer be ignored at these scales, because they limit the performance of nanoresonators. For example, an infinitesimal change in temperature can vary the parameters of the material of the device and thus its frequency. These changes can be rapid and unpredictable. This research highlights that none of the advanced theoretical hypotheses for the causes of the resonance frequency fluctuations explains the level of these fluctuations. Also participating in this study were the Federal Polytechnic School of Lausanne (EPFL, Switzerland), the Indian Institute of Sciences in Bangalore (India) and the California Institute of Technology (Caltech, USA). The paper’s authors received funding from the Carnot Institute (NEMS-MS project) and the European Union (grant ERC Consolidator, Enlightened project).